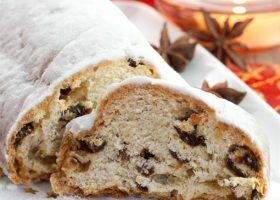 Christmas just isn’t Christmas without some stollen. And this year impress your family and friends with a homemade loaf. To make the batter: Mix flour, sugar and yeast together then add in the milk and using your hands stir to make a soft dough. Place on lightly floured work surface and knead until bright and shiny. Return to bowl and leave to rise in a warm place for about 20 mins. Squeeze the nuts, lemon rind, spice and all the fruit (except cherries) into the risen dough. On a floured surface roll out the dough into a circle shape about 25cm (10") in diameter. Brush the surface of the dough with the melted butter. Spread the cherries in a strip across the centre of the dough. Fold the dough into three (like an omelette) to cover the cherries. Press lightly together and place on a greased baking tray. Brush with melted butter, cover and leave to prove until light and puffy - about 30 mins. Bake in a hot oven 200C/400F/gas 6 for 35-40 mins. Cool on a wire rack. When cold, dredge with icing sugar. On a floured surface roll out the dough into a circle shape about 25cm (10") in diameter. Brush the surface of the dough with the melted butter. Spread the cherries in a strip across the centre of the dough. Fold the dough into three (like an omelette) to cover the cherries. Press lightly together and place on a greased baking tray. Brush with melted butter, cover and leave to prove until light and puffy - about 30 mins. Bake in a hot oven 200C/400F/gas 6 for 35-40 mins. Cool on a wire rack. When cold, dredge with icing sugar.